It is imperative, therefore, to make preparations on how to stay warm before you set out for camp. There are quite a number of camping gears that can help one stay warm during this period—the most obvious requirement of them being a camp tent. The tent does more than provide a covering for the camper and a place to keep his belongings. It also protects the camper from the elements like wind, rains and of course cold conditions. In this article, we will focus on how a tent keeps the camper warm and several helpful tips on how to stay warm in a tent. There are a lot of options to pick from when you need to get a camp depending on the purpose, number of users, climatic conditions and personal preferences. To choose the best for camping, one should first consider the climatic conditions (including the expected temperature) of the campsite. There are three (3) main categories of tent one should consider naming the 3 season tent, the 3+ season tent and the 4 season tent. The 3 season tent is the most versatile tent and can be used during warm seasons and warmer periods of the cold seasons. 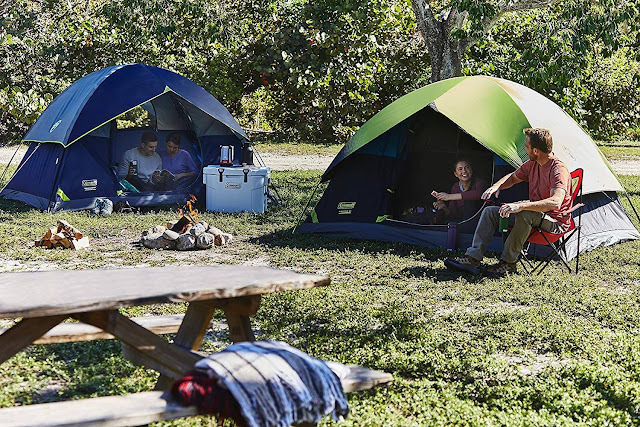 Given that most camping activities happen during the warmer seasons, most people make do with 3 season tents which usually are simple, lightweight and can handle rain during spring, summer, and fall. The 3+ season tent is a lot like the 3 season tent, just that they are designed for prolonged usage. These extended season tents are built to be sturdier and can handle more adverse conditions than the 3 season category. If you’re looking to get more warmth from your tent, then the 3+ tent is where you should start looking. The 4 season tents are the strongest kind of tents designed to withstand severe weather conditions—heavy winds, substantial snow, and freezing temperatures. This ideal for the adventure of winter camping. Secondly, ensure you get a tent of the right shape and size. Square shaped tents are ideal since they better allow for a place to move around and to keep other camping gears. Regarding the tent size, it is advisable to choose a tent that just accommodates you and your belongings. This is important because the excess room in the tent dissipates heat faster making it cooler than you may want. With your camp tent ready, here a few things you can do to stay warm inside the tent. Long before it starts to get dark, look out for a good flat location to pitch your tent. Also look for a place where there’s dry soil as this will be better for warmth during the night. Insulated tent rugs keep cold from creeping into your tent through the tent floor thereby keeping the tent as warm as possible. A fitted tent rug or carpet made of insulation material is ideal for this but if it is not available, you can use regular picnic rugs inside the tent to prevent cold coming from the ground. Morning frost or ice that stay on your camping tent can condense during the day and make your tent wet. To avoid this, ensure you remove them early in the morning before it melts. Also, ensure that the tent is in a place where it can dry during the day because moisture on a camping gear is not good for warmth. Yes. Don’t wait till your cold before you seek warmth in your tent. The tent just like your sleeping bag helps you keep warm by conserving your body temperature and space within it. So, if your body temperature is already low, you may not get as warm as you should inside the tent. Only advisable in extreme cases. You can use a portable heater powered by electricity (if available) or gas. This also requires strict safety precautions. To stay warm in a tent, you will need to combine other tools like a hot water bottle, disposable heat packs, and of course a well-rated sleeping bag. A sleeping bag uses the principle of thermal insulation to keep the user warm. 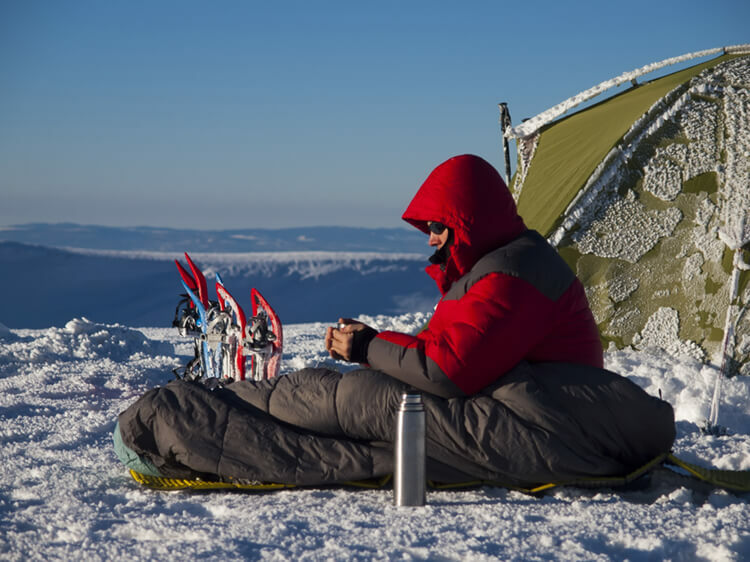 Just like in tents, a 4-season sleeping bag is best suited for very cold conditions. Other general tips on how to stay warm while camping in coldweather can be found here. 1. What does the temperature rating mean on a sleeping bag? This is the lowest temperature an average man can sleep comfortably at night in the bag. It is known as the comfort rating. Other ratings are the extreme rating as well as the upper and lower limit ratings. 2. How do you stay warm in a sleeping bag? Sleeping bags use the principle of thermal insulation in which duck feather or synthetic insulation locked between layers of cloth to prevent loss of a person’s body heat. 3. What is the best winter sleeping bag? A sleeping bag with a comfort temperature rating of 10 degrees with down insulation and fill power of 800+ will do.